Boldly refusing to ride side saddle, Bessie Heard became the first woman to straddle a horse in McKinney during the late 1800s. She was also the first female to ride a bicycle in town—unusual occurrences in that day and age. Although her grandmother described her biking as "most undignified for a young girl," Bessie was truly a Southern lady who was bold and independent throughout her long and extraordinary life. She was definitely a woman ahead of her time. Bessie felt a deep appreciation for nature and a strong desire to conserve, preserve and share this natural heritage with others. Often referred to affectionately as "Miss Bess," she is described by those who knew her as a lovely lady, both very generous and kind, with a special love for children as well as nature. A lifelong commitment to her community culminated in the grandest achievement of all—creating a museum and wildlife sanctuary at the age of 80. Bessie was an environmentalist long before the word was popular and was determined to do something about her surroundings. A self-described "pack-rat", she was a collector extraordinaire who acquired things until her extensive collections of seashells, butterflies and original nature prints by Audubon and Redoute outgrew her home. Bessie was born in 1886, the eldest of five daughters (two of whom died in infancy), to John Spencer Heard and Rachel Caroline Wilson Heard. Her mother was proficient in the fine art of china painting, an accomplished musician and an avid gardener who had two green houses. She lived a life of refinement and culture with a strong emphasis on nature. Her father and uncle, Steven Heard, were instrumental in establishing many new businesses in McKinney including the North Texas Traction Company which ran an electric interurban train between Denison and Waco. Provided with their own passes on this most modern mass transit of its day, the Heard sisters often traveled to Dallas on shopping excursions. Miss Bessie noted that she rode very often and most likely purchased many hats—her favorite fashion item. Although she lived a non-traditional life by not marrying, Bess had a very active social calendar. She spoke of "enjoying the privilege several different years" of leading the Grand March during the annual Elks' Christmas Ball on the arm of the club's president. 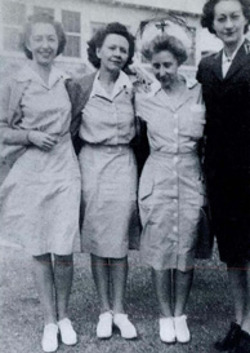 The Heard sisters also attended other Texas galas such as the military balls at Texas A&M University. Bessie had said, "There was always something very special about dancing with a gentleman in full dress uniform with a sword at his side." After attending McKinney Collegiate Institute—a private school founded by several citizens (including her father)—Bess ventured far from McKinney to attend Mary Baldwin College in Staunton, Virginia for three years of formal education. […] A 1902-1903 college yearbook featured Bess Heard as a member of the "Black Diamond" basketball team. Before continuing her formal education, she toured Canada and Europe in 1913 as part of an educational tour for young ladies. In 1916 Bessie became a student of the famous Parson's School of Design in New York City where she pursued studies in the newly-emerging interior design field. Upon returning home to Texas, Bessie Heard accepted a position at Hallaby's Galleries (later a part of Neiman Marcus) as one of the few interior decorators at that time. Bessie eventually returned home to care for her ailing parents leaving behind a successful career but beginning a long and fruitful civic life in McKinney. Inspired by her great love of trees, her first civic activity was a tree-planting beautification project for the city. Many of the hackberry trees are still growing along the streets of downtown today. Bessie Heard delighted in showing her collection of seashells and butterflies to the area children. Encouraging them to feed and care for the birds, she sponsored a birdhouse contest on her front lawn. With the advent of World War I, Bessie served as a "Gray Lady" with the local American Red Cross Chapter which she was instrumental in establishing. She then focused her energies on establishing a much-needed library. According to many who knew her, creating opportunities to educate children of McKinney was truly a lifelong concern. Bessie's strong belief in education is evident in the many scholarships and other monetary gifts provided through the years to individuals for achieving their academic goals. She belonged to the McKinney Art Club—the oldest art club in the state—a women's study club called the Delphian Society, and, not surprisingly, the McKinney Garden Club. She also was a member of First Presbyterian Church and a supporter of conservative politics. As she saw the continued growth of McKinney in her later years, Miss Bess felt too much land was being covered in concrete. So, when many would expect a woman in her late seventies to be rocking contently on the front porch of her family's stately home, Bessie Heard consulted John Ripley Forbes, president of the National Science for Youth Foundation. She wanted to establish a museum for her collections and a place of preservation and learning for the families of McKinney. Her vision took shape with the formation of the Bessie Heard Foundation in 1964, followed by museum construction in 1966 and culminating with the opening in 1967. Through this whole project, Bessie Heard was an active participant from the personal selection of the property, to checking on construction, to discussing details after the museum's opening, according to Dr. Harold E. Laughlin, former director of the Wildlife Sanctuary (now deceased). 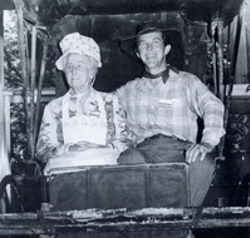 Miss Bessie lived to see her museum and wildlife sanctuary on its way to becoming the number one cultural attraction in Collin County. She died March 22, 1988, just two months shy of her 102nd birthday, outliving her two sisters and only niece and nephew to whom the museum is dedicated. Undoubtedly, Bessie Heard would highly approve of the current facility and its programs that have grown from her initial collection. Today, the museum features exhibits of natural history, seashells, fossils, archaeology, rocks and minerals and live native animals. … The 289-acre wildlife sanctuary is a haven for more than 240 species of birds, mammals, reptiles and amphibians, not to mention nearly 150 species of wildflowers and many other growing plants. A 50-acre wetlands was completed in the fall of 1992 featuring an outdoor learning center with observation deck, floating study laboratory and boardwalk. * Later, the Science Resource Center, an outdoor amphitheater with seating for over 500 guests, and the Ropes Course were constructed. Read more about Miss Bessie Heard. As the Heard celebrates its 47th year, we reflect on the thousands of children that have benefited from her dream. Last year nearly 90,000 people were involved in activities the museum offered. McKinney continues to grow by leaps and bounds (and according to the U.S. Census Bureau is the 5th fastest growing city in the country). Bessie Heard's vision—her museum and nature preserve—is now more than ever, a priceless gift to the community. She has provided a "living" legacy in the fullest sense.